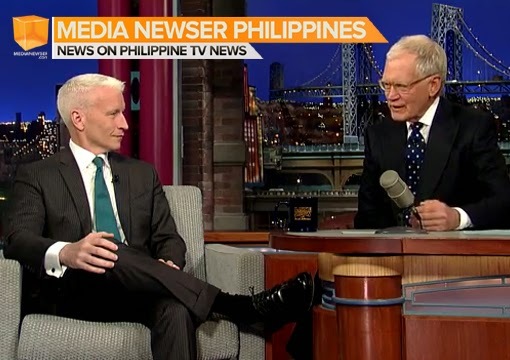 CNN's Anderson Cooper appeared as a last minute guest on Tuesday's Late Show with David Letterman, wherein he talked about embattled Toronto mayor Rob Ford, and his recent visit to the Philippines to cover the aftermath of typhoon Yolanda (Haiyan), among others. When asked by Letterman if they've learned something new from this record-breaking storm, Cooper once again brought up the Japanese government and its immediate response to the devastating earthquake and tsunami in 2011, to make a comparison. "You hope that you learned something new with each and you know relief workers do learn something new. It's easy for reporters to come in and be critical, but it's never gonna be fast enough -- the relief. That said, if you know that the biggest storm ever to hit, is going to hit... You know the Philippine government talked about pre-positioning supplies. Clearly, whatever supplies they have prepositioned were not enough because nobody had food and nobody had water." "In Japan, after the tsunami, which is obviously much more organized than the military there -- they had soldiers out the next day with sticks, just going block by block in an organized way trying to look for survivors in the wreckage. There was none of that for five to six days that I saw." When Letterman said that it's a typical scenario whenever there's a meteorological event, Cooper said that the local government is just not set up to provide an immediate relief to the people in the south. "Look, Philippines is an amazing country, it's a poor country, in a lot of the areas where the storm hit. It's obviously... the government is not set up to provide relief in this kind of way. It was upsetting to the people there who were searching for their children not to have any assistance," he said. Letterman then asked Cooper whether this kind of coverage will ever stop him from undertaking more globetrotting assignments, he said: "I honestly think it's an honor to be there and to be able to give voice to people who don't have a voice, who don't have access to power and to be able tell that woman's story." He continued: "You know there's nothing bad things happened all around the world but there's nothing sadder to me than a person lived a good and decent life whose family ends up dying on the side of the road, dissolving into nothing and nobody even notices their passing, and nobody in authority helps in the search for them, and nobody tells their story. So I don't believe it really changes much but I do believe in the power of just of honoring those who have passed and learning their names and learning who they are in the life they've live." In related AC news, Cooper just signed another three-year contract with CNN, which will keep him within the network at least through the 2016 U.S. presidential election. Cooper will also continue with his long-term deal with CBS' 60 Minutes, which airs locally on Solar News Channel.